IT in India has come a long way since it first appeared in the 1980s, when US technology companies started leveraging the cost arbitrage between US and Indian programmers. The liberalization of certain economic policies that started in 1991 led to the birth of innovative companies, such as Infosys and Wipro. These companies used the “quality route” to grow their business—Indian IT companies followed the five levels of the Software Engineering Institute’s certification more than any other country, including US. The arrival of the Internet and imaginative government policies, such as fast and easy access to international data circuits and tax benefits through Software Technology Parks of India (STPI), led to further growth. Then, by the turn of the century, the IT industry started focusing on what I refer to as EQQ—English language skills for engineers and higher quantities of quality engineers. EQQ gave India an advantage over Ireland (which had fewer programmers), China (which lacked engineers proficient in English), and the Philippines (which lacked qualified programmers). The Y2K phenomenon that led to a global shortage of programmers propelled Indian IT companies into a position of global leadership. By the middle of the last decade, Indian IT had arrived. India’s IT industry is growing steadily. Indian IT companies have reached the global stage and are undertaking interesting IT projects. The IT sector has created jobs for 2.8 million IT professionals and has indirectly employed an additional 8.9 million. The rapid growth of engineering education, with more than 500,000 undergraduate IT engineers graduating per year, feeds into this steadily growing IT industry. For the 2012 financial year (which ended March 2012), annual business crossed US$100 billion in sales revenue, with IT contributing to 7.5 percent of India’s GDP. Furthermore, India had 58 percent of the “global IT services” outsourcing revenue. Indian IT services account for 25 percent of its exports. Most Fortune 500 companies outsource some of their work to Indian IT companies, and many (almost all in the top 100) operate either directly or indirectly in India. The IT company Tata Consultancy Services reached $10 billion in annual revenue by March 2012, with a healthy bottom line (22 percent). Another company, Infosys (with $7 billion in annual revenue), created the “ACM Infosys Foundation Award for Computing Science” in 2007 to celebrate 25 years of service (awards.acm.org). Fortune magazine recently named Infosys founder NR Narayana Murthy, who is known for his unique way of combining capitalism and socialism, as one of the 12 greatest entrepreneurs of our time. Over the past five years, India has spent billions of dollars on its e-governance project—one of the largest e-governance projects in the world (http://negp.gov.in). Al though India has had significant success in IT services (including business-process outsourcing), it has yet to strike gold with IT products (hardware and software) and intellectual property (IP). There are just a handful of success stories, one of which is the Finacle software suite from Infosys. -Creating IP in areas where Indian IT companies have strength or for local markets. The consumption of IT within India must improve too. In addition to surging exports, IT should improve efficiencies within the Indian industry. Although a lot has yet to be achieved, India successfully transformed its banking through widespread IT adoption. Thanks to the Reserve Bank’s constant push for technology upgrades in the banks, the banking sector saw core banking, ATM, and multichannel banking implemented across all the banks. Efforts are ongoing to get those citizens who aren’t covered by banking (a significant portion of India’s population) covered through “no frill,” inclusive, or mobile banking. Areas such as industrial automation and medical electronics are embracing open standards and starting to use commodity hardware. Leading companies in those domains—such as ABB and Siemens—could soon become “IT companies.” Indian IT is thus likely to enjoy steady and sustained growth for at least another decade. However, the Indian IT industry must overcome some roadblocks to maintain its current rate of growth. Increasingly, global markets (including in the US) are trying to prevent outsourcing—particularly to “low cost” destinations like India. India has seen higher internal costs (mostly wages), reduced productivity, and unionism among its IT employees. The Indian IT industry has had double-digit wage increases for many years, whereas wage increases have been considerably lower elsewhere. For example, the 2012 projected salary increase for India is 12 percent, whereas it’s 9.5 percent for China and 7 percent for the Philippines. Universities haven’t been able to graduate large numbers of high quality professionals to take up jobs in the IT industry. There’s an acute shortage of faculty in higher education due to much smaller enrolment in graduate studies compared to undergraduate degrees. In addition, faculty compensation is insufficient. However, things are improving with the start of new Institutes of Information Technology (IITs), Central Universities (including “Innovation Universities,” which focus on new technology and inter/cross-disciplinary research in emerging areas), and capacity increases in existing institutions- along with the recommendations of the Sixth Pay Commission in 2010. India must address disruptions in business models. For example, new applications are fundamentally changing how software is produced (in very small groups or by just a single person), delivered (over the “cloud”), and consumed (using appliances like smart phones). Project Aadhar, which started in 2009 and is one of the most ambitious IT projects in the world, aims to provide a unique ID to every citizen (http://uidai.gov.in ). By 2014, using a combination of biometric measures, Aadhar aims to identify every Indian and accept or reject identity claims within a few seconds- for the 1.2 billion Indians spread out across the country. -variety (books, stationery, electronics, laptops, Mobiles & tablets, cloths and recently digital rights. Flipkart also address the unusual Indian needs of “cash on delivery” (most of the adult Indian population doesn’t use credit cards) and “credit-card swipe on delivery” (for the younger generation, which uses credit cards but doesn’t trust online Internet commerce). RedBus provides Internet-based ticketing solutions for small and often unorganized bus operators across the country (www.redbus.in ). Founded by Phanindra Sama, Charan Padmaraju, and Sudhakar Parapuneni—IT professionals from three different parts of India—RedBus currently helps more than 350 operators driving more than 4,500 routes. Millions of RedBus customers can go to any of the 4,500 outlets to buy a ticket, from anywhere to anywhere. TutorVista, a leading online education company (www.tutorvista.com ), was incubated at the Indian Institute of Information Technology, Bangalore. Its founder, serial entrepreneur Krishnan Ganesh, bet on the Internet in 2005 to help high school students in the US with online tutoring. His unique selling proposition was to offer quality teachers at an affordable price. Pearson acquired TutorVista in 2011, and today it has 2,000 teachers across India, the US, the UK, the United Arab Emirates, Australia, China, and South East Asia. The tutors help students in math, physics, chemistry, biology, and English and with test preparation and homework. IT in India has seen amazing growth, thanks to the liberalization of economic policies, conducive government policies, growth in higher education, and the uptake in entrepreneurship. Several countries are attempting to leverage IT for their economic development, and focusing on the key issues of education, policy support, and entrepreneurship is likely to pay rich dividends. Unless Indian education and research (on the supply side), IT companies (on the demand side) , and the government and media (enablers) continue to innovate, India might not be able to sustain its current leadership position in this area. By : Sowmyanarayanan Sadagopan The author is Director, Indian Institute of Information Technology, Bangalore. Equitable development is dependent on sustained growth of an economy which is critically reliant on the sustainable development of infrastructure. Infrastructure is, therefore, a driver for inclusive growth. However, investments in infrastructure are not easily available due to requirements of lumpy capital investment with very low returns. Such investments are justified normally on grounds of social benefits rather than on financial viability. India is poised to become the third largest economy in terms of GDP in the next two decades. At present, along with China, it is one of the fastest growing economies in the world. The growth momentum needs to be sustained to ensure that the fast pace of growth does not peter down. Absence of world class infrastructure facilities in India is often considered as one of the major impediments to growth. With the sprawling urbanization, demand for infrastructure continues to rise faster than the capacity in the economy to satisfy such demands. Glancing across the major infrastructure sectors, it is found that apart from telecom where teledensity is extremely high (79.28 in May 2012 as compared to 0.31 in 1981) and tariffs one of the lowest in the world, other sectors are yet to achieve levels of stable growth coupled with quality services. India has a road network of 33 lakh kilometres which is the second largest in the world. These roads carry 65 percent of the freight traffic and 80 percent of the passenger traffic of the country. National Highways carry 40 percent of the traffic, yet constitute only 1.7 percent (71,772 kms) of the total road network in the country and rural roads cover a length of about 26.5 lakh kms. Only 20 percent of this National Highways network is four-lane, 50 percent two-lane and 30 percent single-lane. The State Highways have also suffered from prolonged neglect. the share of goods and passengers carried has come down drastically since independence. India has a total installed capacity of 2.03 lakh MW of power as against 1,362 MW in 1947. Thermal power forms 66.32 percent of this capacity and about hydel power 19.2 percent. The per capita consumption has increased 49 times since independence and stood at 813.3 kwh for the year 2010-11. This was, however, less than one-third of the world average per capita consumption of power. The power sector suffers from a peaking deficit of 9.8 percent and an energy shortage of 8.5 percent due to underinvestment and poor maintenance. The distribution segment of the sector suffers from average Aggregate Technical &Commercial losses of 27 percent and as per the 13th Finance Commission’s projections, in absolute terms, these losses are projected to increase to Rs. 1.16 lakh crore by the year 2014-15. At the end of the 11th Five Year Plan, India was the 9th largest civil aviation market in the world with a passenger handling capacity of over 220 million and cargo handling capacity of 3.3 MT. However, air travel penetration continues to be low at 0.04 air trips per capita per annum. The Indian civil aviation sector was able to attract private investment of about Rs. 30,000 crore in four airports at Delhi, Mumbai, Hyderabad and Bengaluru. Airports Authority of India had a plan to develop 35 non-metro airports in the country. Of these, 26 have been developed and the balance would be completed in the current financial year. The Indian maritime sector handles 95 percent of India’s foreign trade by volume. There are 13 major ports and 187 minor/ intermediate ports in the country. In the year 2011-12, the major ports handled 560.1 million tonnes of traffic and the total cargo handled by all the ports together was 915 million tonnes. The average turnaround time at major ports has increased from 3.93 days to 4.67 days between 2006-07 and 2010-11. There has also been a deterioration of 3 percent in the pre-berthing detention time. In the initial Five Year Plans, it was widely believed that agriculture needed the necessary push to sustain the economy and the basic needs of food for the masses needed to be met. There was also considerable importance attached to setting up heavy industries. Infrastructure requirements were proposed to the extent of meeting the aforesaid objectives and were never the stated objective of the Plan exercise as such. However, there was heavy allocation of resources towards irrigation and power since the two were necessary for the development of the agrarian economy and industries. At a later stage in the 60s and the 70s, development of roads also picked up momentum. In the mid-80s onwards, the thrust of the development process was towards obtaining state of the art technology for the country. This resulted in impressive development of communications technology. It was only from the Ninth Plan onwards that there was a definite thrust towards infrastructure development in the Five Year Plans. 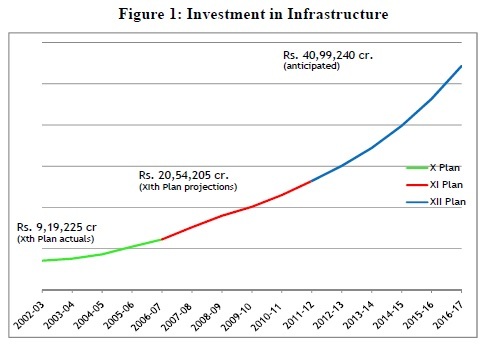 In each of the previous two Plan periods, the investment in infrastructure has almost doubled. This is evident from Figure 1. Fast economic growth in the last two decades has increased demand for land from many sources, such as infrastructure, industry, resource extraction (such as mining), and urbanization, including real estate. Even when many of these activities are funded privately and driven by profit motive, they serve a social purpose, as employment generation per unit of land is higher in non-agricultural uses than in agriculture. For instance, a 4000 MW thermal plant may displace about 250 households but would create tens of thousands of new jobs by providing power to small industry and tubewells that would increase both gross cropped area and productivity. At present the share of urban dwellers in total population of India is 32 percent, but they occupy only 6 percent of the total area of the country. Thus growth through industrialization and urbanisation would not only increase labour productivity but will reduce pressure on farm land by pulling people away from land to non-farming occupations. However, land acquisition has emerged as the most important structural constraint in India to the process of fast industrialization and improvement in infrastructure. Delays in procuring land leads to uncertainty and cost escalation, and thus affects development. Acquisition of land by government has lately drawn resistance in many cases due to inadequate compensation for the land and loss of livelihoods of the affected people, as well as for involuntary displacement without proper rehabilitation. Moreover, people are not willing to give up their present dwelling and occupation of farming for a dark future totally dependent on the vagaries of market. The present land acquisition law has been quite hostile to the interests of the landowner, as it attempts to make land available to industry through government at a minimal price. So far the practice in most state governments has been to coerce people to give up their lands by using the legal powers of eminent domain, and in some cases even through the use of force. Thus the model followed has been, ‘let some people lose out so that others (this includes some enterprising poor too) may gain’. Unfortunately the losers tend to be the poorest with little skills, often tribals, who are unable to negotiate with the market forces and cope with the consequences of their forced expulsion from land, and end up much worse off than before acquisition. The Bombay Stock Exchange (BSE) first ever stock exchange in Asia (established in 1875) and the first in the country to be granted permanent recognition under the Securities Contract Regulation Act, 1956, BSE Limited has had an interesting rise to prominence over the past 137 years. BSE has facilitated the growth of the Indian corporate sector by providing it with an efficient capital raising platform. Today, BSE is the world’s number 1 exchange in terms of the number of listed companies (over 4900). It is the world’s 5th most active exchange in terms of number of transactions handled through its electronic trading system.